I love cupcakes, just ask anyone who knows me. I think it's the cake-to-frosting ratio that I love...almost 1:1. Yum. My mouth is watering, just thinking about it. My favorite cupcake place is New York Cupcakes in Bellevue. Their frosting is so buttery, and the cake is so moist and DE-licous! This is really a 4x4 card with a 3" circle punched and stuck on the top. Makes it interesting...Plus, it will still fit in a "standard" envelope. I made the top of the cupcake with Close To My Heart's Scallop Punch, then I trimmed the bottom off. The cupcake liner is made with a crimper. Very easy! 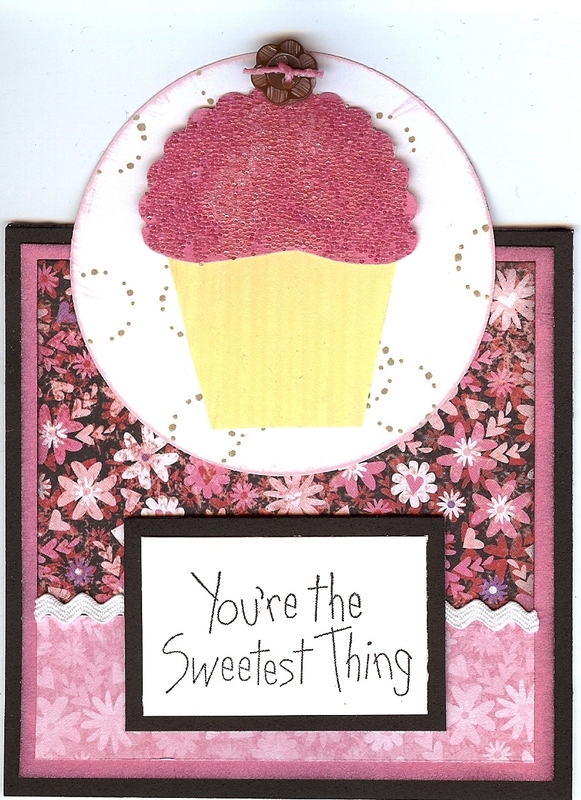 The most interesting part of the card is the glass beads that I stuck on top of the "frosting." First I put Liquid Glass all over the "frosting," as an adhesive and smeared it around with my finger. Then I sprinkled the small size glass beads on top of that. It's a little slow drying, but I love the look! I used Martha Stewart Glass Beads. You should try making some cupcakes today! These are non-fattening. TIP: To stick the button on top - I made a little adhesive 'sandwich.' I wanted to pop the button up, so it wouldn't be below the frosting, but I knew the foam mounting tape wouldn't properly hold the button. So I made a Glue Dot - Foam Mounting Tape - Glue Dot 'sandwich' below the button. Worked perfectly! "Don't bother me, Can't you see I'm trying to get some rest!?" 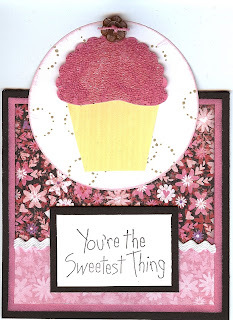 My husband says I am obsessed with cupcakes as well! Thanks for the tip on New York Cupcakes...might have to make a trip there this weekend! 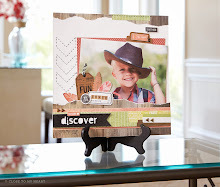 July Stamp of the Month Blog Hop!